After yesterday’s post about Dromore Castle, County Limerick it transpires that tomorrow in London Sotheby’s will be selling a chair the original of which was designed by Godwin for the library of the house. 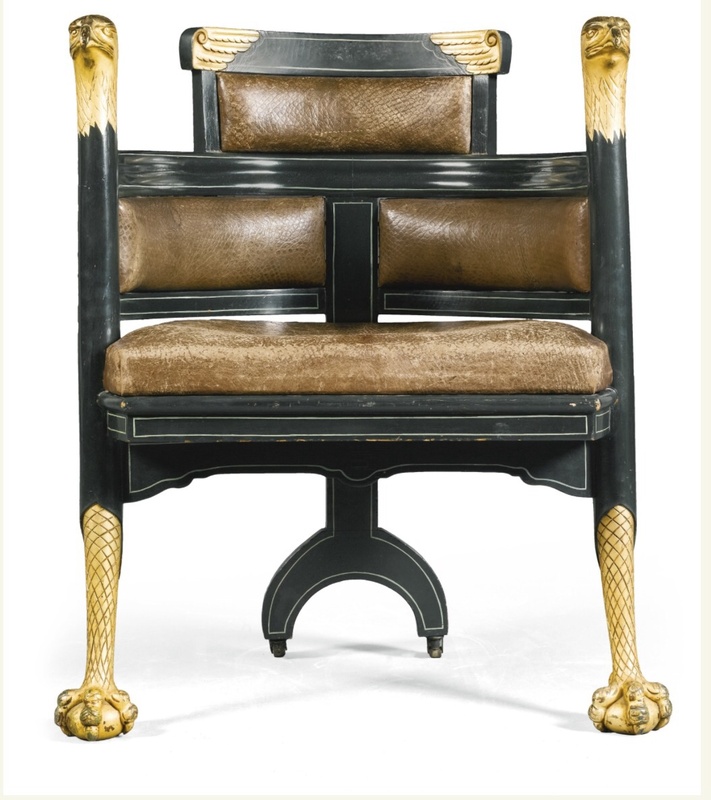 The ‘Eagle’ Chair is more Egyptian than Gothic in inspiration and indicates how eclectic were Dromore’s interiors. Like all the other furnishings, it was manufactured by William Watt’s Art Furniture Company and some pieces including this one featured in the company’s 1877 catalogue. It is unknown how many ‘Eagle’ chairs were subsequently produced: a version in oak with variant stretcher and reupholstered in brown leather was sold at Christie’s, London in May 1995 for £18,400. This one carries a pre-sale estimate of £8,000-£12,000. 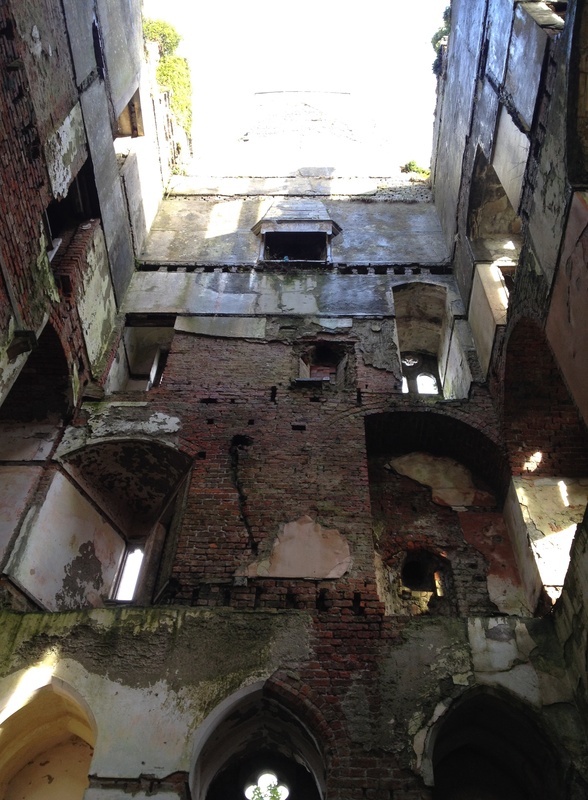 The history of Dromore Castle, County Limerick and the work of its architect Edward William Godwin were discussed here some weeks ago (see Une Folie de Grandeur, 30th December 2013). 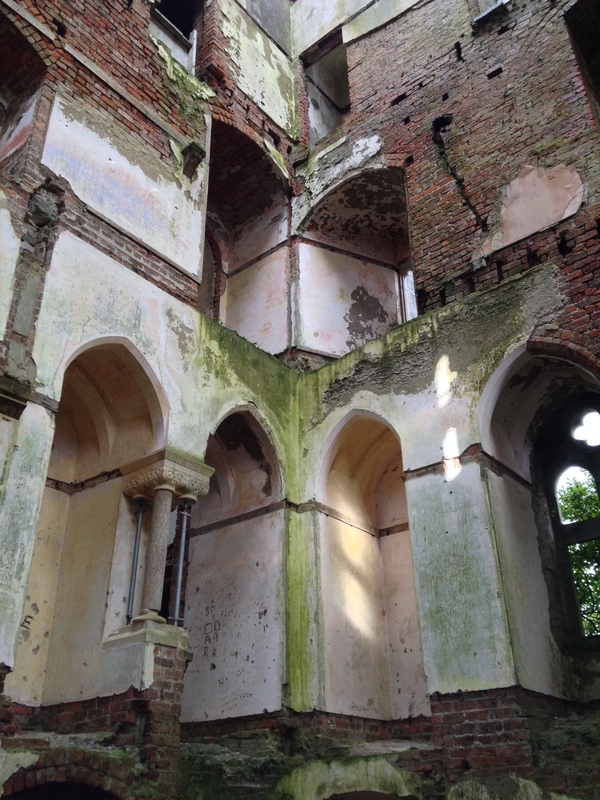 Today the focus is on what remains of the building’s remarkable interiors since every aspect of their original decoration – furniture, wall paintings, chimney pieces, stained glass, tiles, brass- and ironwork – was likewise overseen by Godwin. 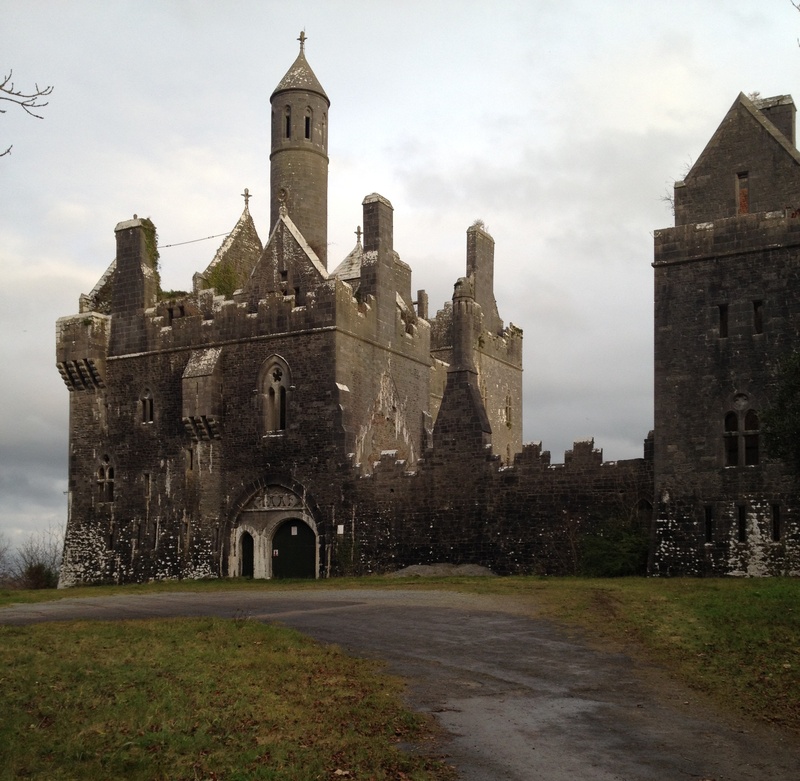 It was in the mid-1860s that William Pery, third Earl of Limerick decided to rectify his lack of a country seat in Ireland where the family had long owned thousands of acres of land in Counties Limerick and Cork. Hitherto when not in England he and his forebears had occupied an 18th century house in Limerick city but this was no longer deemed satisfactory. His decision to create a new rural residence coincided with Lord Limerick’s friendship with Godwin, the two men then respectively serving as President and Vice-President of the Architectural Society in England. 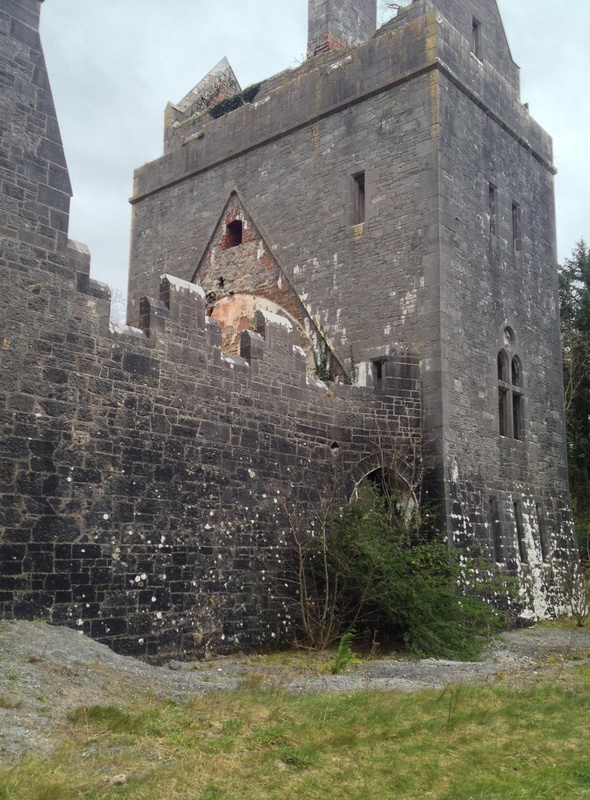 An article on Dromore Castle written by Marian Locke and published in the Winter 2011 issue of the Old Limerick Journal states that Godwin thoroughly explored his prospective client’s estates in search of a site without finding anywhere he deemed suitable before coming across a small shooting lodge owned by the Earl on a piece of land of some forty acres overlooking Dromore Lake. This the architect decided was the perfect spot, ‘a dream-like situation on the edge of a wood…overlooking the water, which would reflect the castle one hundred feet below.’ As indeed it still does, Lord Limerick buying up a further 200 acres, seventy of which were covered by aforementioned water. So the rocky outcrop on which Dromore stands, and the views offered from this position, made certain other decisions inevitable, not least that the greater part of the accommodation would face north, hardly the best way to ensure the building’s interior would retain heat, or receive much sunlight. 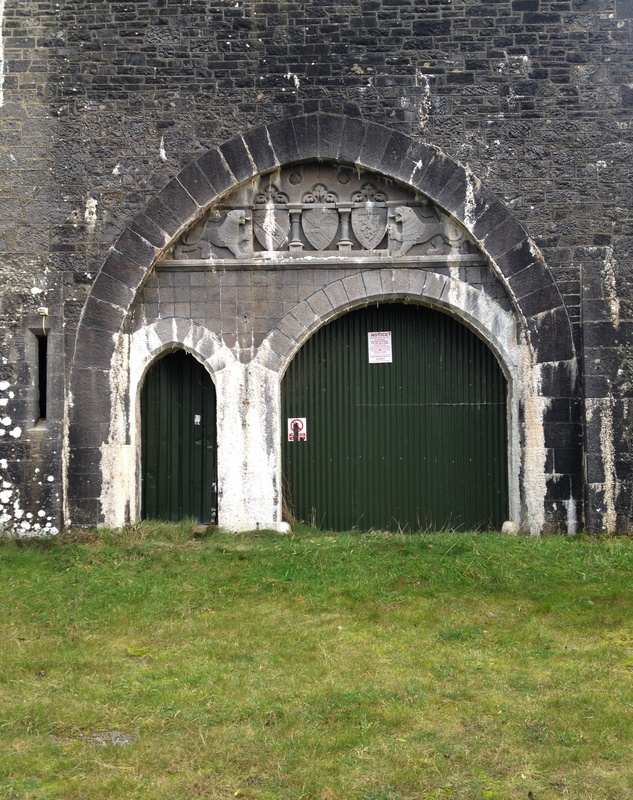 Access to Dromore Castle is through a gateway on the western side and immediately to the south, only accessible by first stepping outside, was the large double-height banqueting hall seen here. 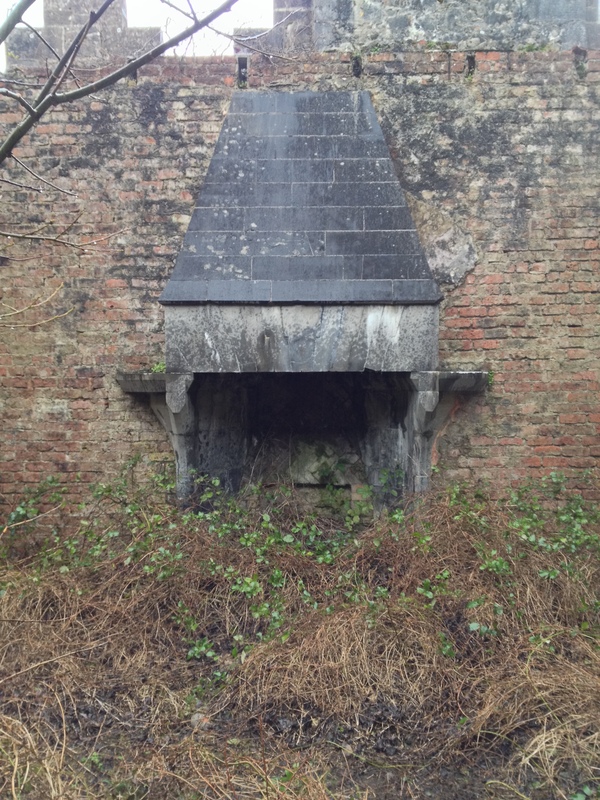 This still has its hooded stone chimneypiece, but the minstrels’ gallery has gone along with the pitched timber roof. 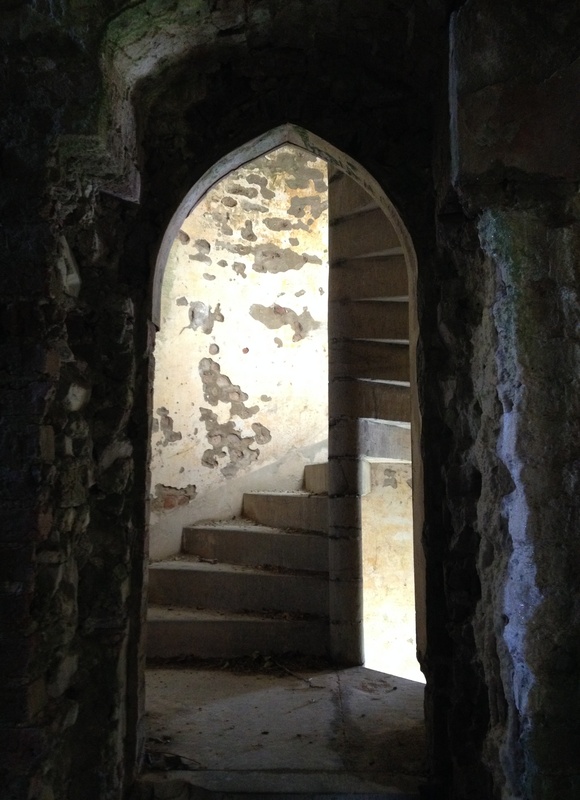 A door at the far end of the hall gave access to a slender three-storey Chaplain’s Tower which on the first floor in turn opened onto south-facing battlements, concluding in the easterly corner with a small block that originally served as a bakery. The main portion of the castle runs west to east, with a chapel located on the first floor over the main gateway; above this looms the round tower that is one of Dromore’s more unusual features. Most of the northwest corner is taken up by a stone staircase leading to the first floor where it terminates in an arched gothic window. 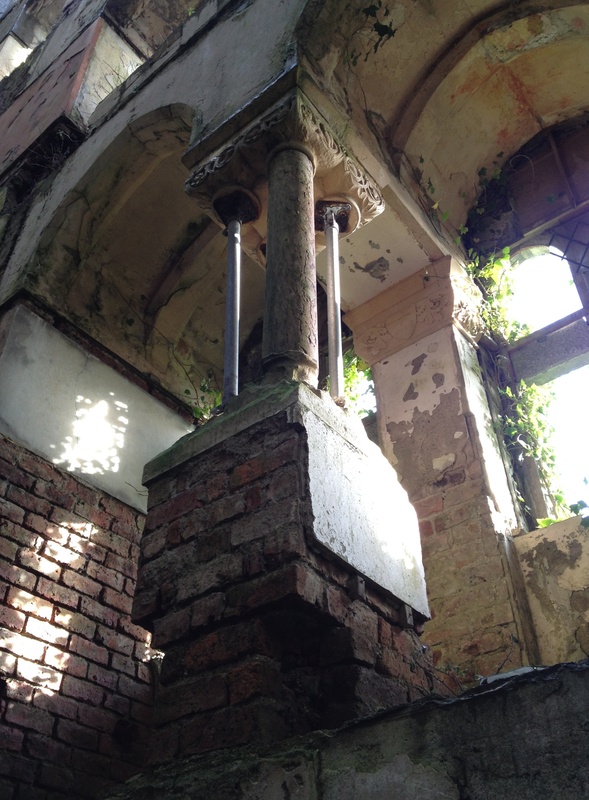 The shape of this window is echoed by stepped barrow vaulting above the steps, one of Godwin’s most striking effects to survive. 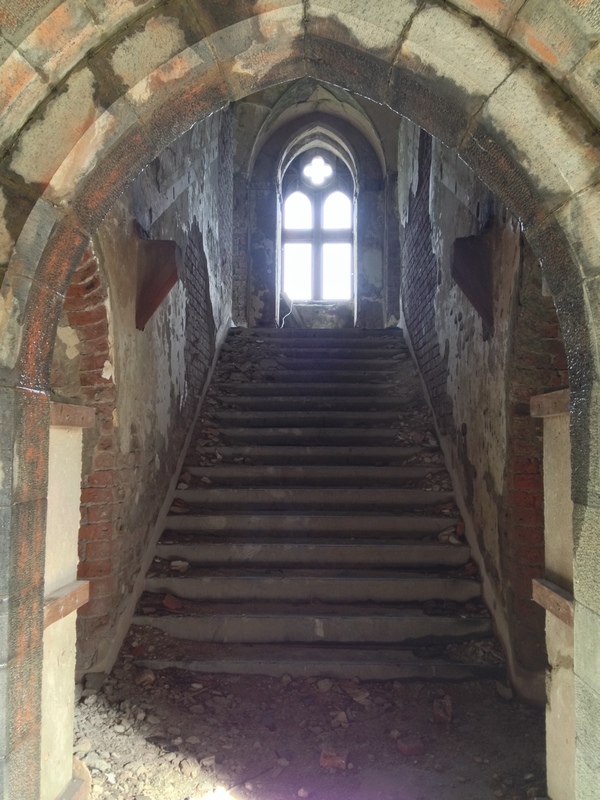 On reaching the top of the main staircase, one turned west along a corridor off which opened a succession of reception rooms inside what, from the exterior, looks like an enormous fortified keep. Thus the entire ground floor was given over to servants’ quarters, with a typically massive kitchen occupying the central portion. A consequence of this arrangement is that the central courtyard was primarily a service area, although a door leading from the southern end of the drawing room opened onto another run of battlements, this time looking eastwards down to the lake (or west into the courtyard). 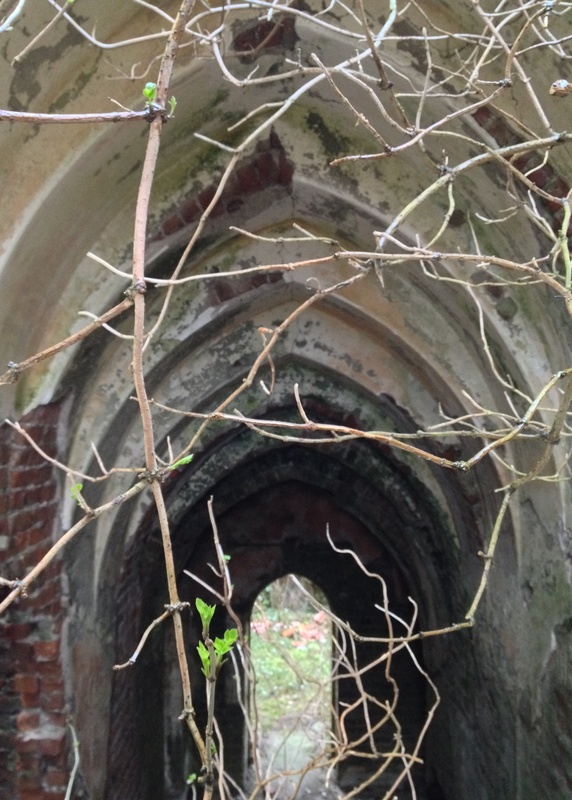 Still, it must have been a drawback that the castle’s owners could not directly enter the surrounding gardens. Perhaps they might not have wished to do so, given the splendour of their surroundings. The drawing room, for example, featured an elaborately carved pink marble chimney piece (which survives, suspended in space), and arched recesses with marble columns (some of which remain in situ) beneath more carved capitals. 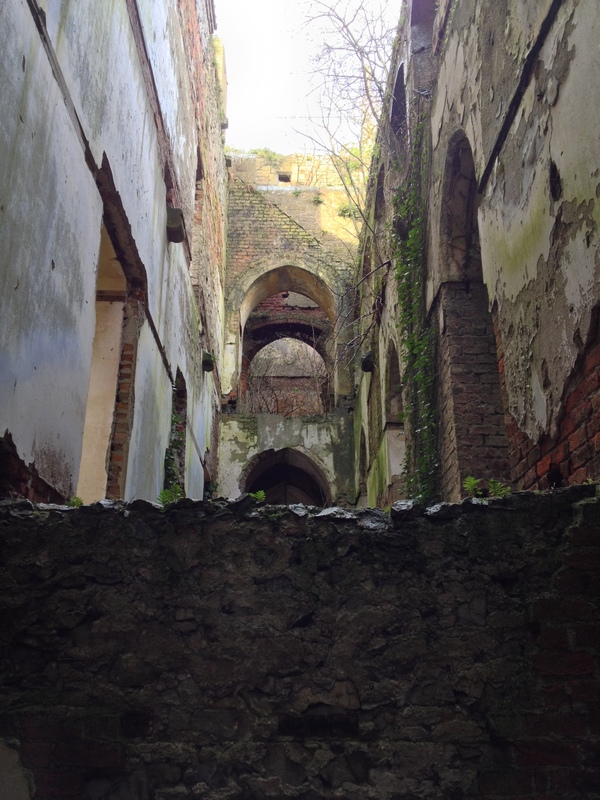 Meanwhile up another flight of stairs one reached a further north-facing corridor, its windows set inside deep arched recesses, off which ran the main bedrooms. At the very end of the passage, the north-east corner was given over to the countess’s bedroom which had a stone balcony providing views of the lake far below but this was an advantage enjoyed by nobody else. The third floor was given over to servants’ bedrooms and then, once more in the north-east corner one ascended to the fourth floor billiard room, something of a break with the spirit of medievalism pervading elsewhere. 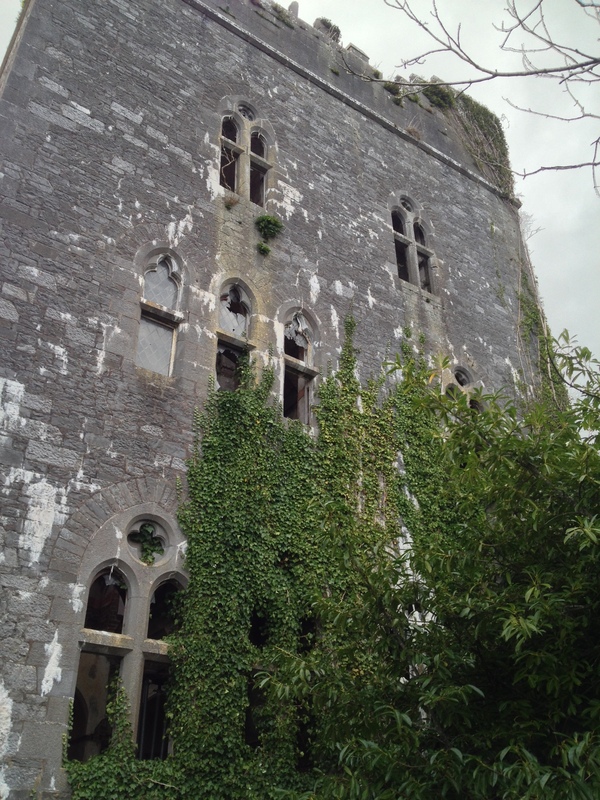 Although the exterior walls of Dromore Castle are up to six feet thick, from the start it suffered from problems of damp. In an attempt to overcome this problem, Godwin designed a brick lining with a cavity of about two inches from the stonework, but to no avail. In an article on the building carried by Country Life in November 1964, Mark Bence-Jones quotes from a lecture the architect gave in 1878, that is less than a decade after completing his commission, in which he commented ‘Whenever it was going to rain…the walls showed it like a weather glass.’ Thus the elaborate murals he designed for the main rooms never had a chance of survival. At least some of these were executed by Academician Henry Stacy Marks, an artist who specialised in painting birds. 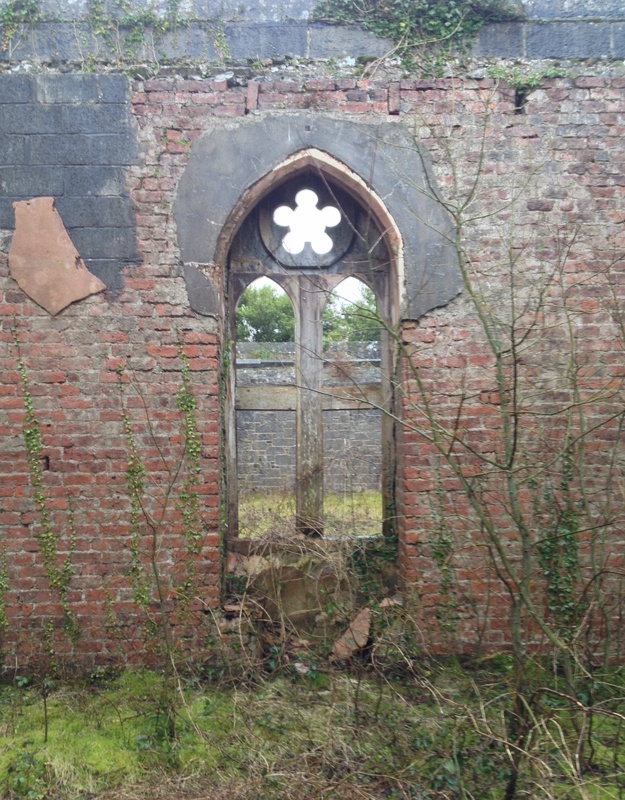 At Dromore, however, the plan was for him to cover the walls of the first-floor corridor were to depict the four seasons, twelve months and day and night (complemented by stained glass windows showing the six days of earth’s creation). The dining room murals featured the eight virtues, those of the drawing room the four winds and the four elements. Alas, none could withstand the harsh Irish elements and before long all had perished. 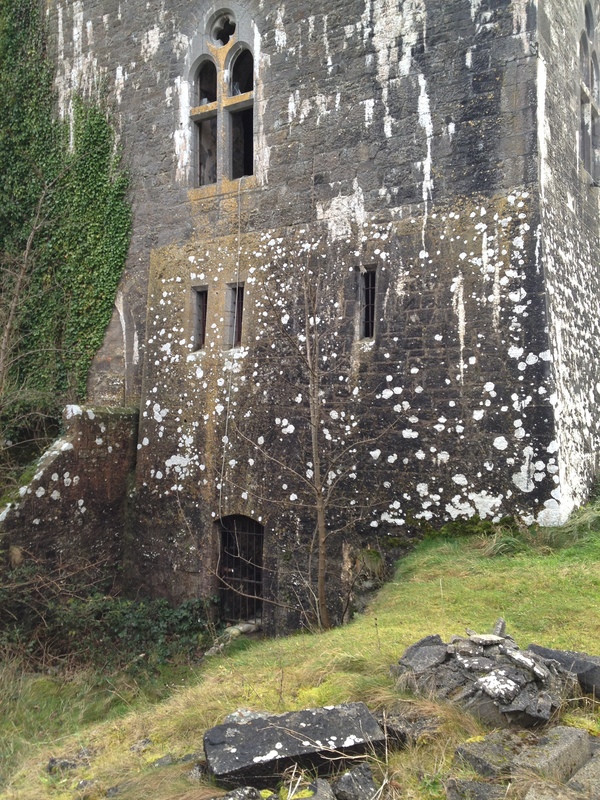 Nevertheless, according to Bence-Jones Lord Limerick was ‘extremely delighted’ with his new property, even if this delight did not encourage him to spend much time at Dromore. According to Marian Locke, Dromore cost in the region of £80,00-£100,000 to build, and yet it was only intermittently occupied by the Limericks for fifty years. After the First World War the family effectively abandoned the property and finally in 1939 the castle and many of its contents along with the surrounding land were sold, reputedly for just £8,000, to a local timber merchant Morgan McMahon. 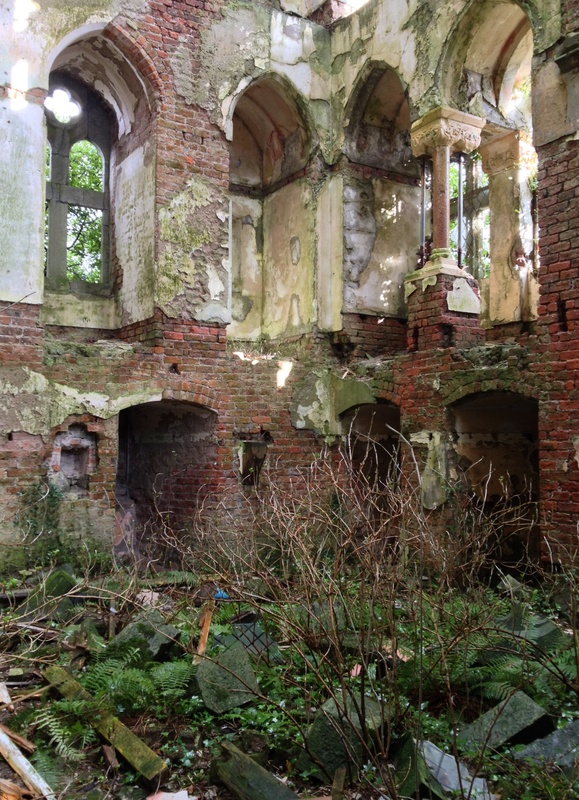 Although he bought the estate primarily for the value of its woodland, Dromore’s new owner was so engaged by the place that he and his family carried out necessary repairs and moved in. They remained in residence until the mid-1950s when it was again sold, but this time there was no reprieve. Faced with costly maintenance and rates, the new owners removed the roof and stripped out the interior. 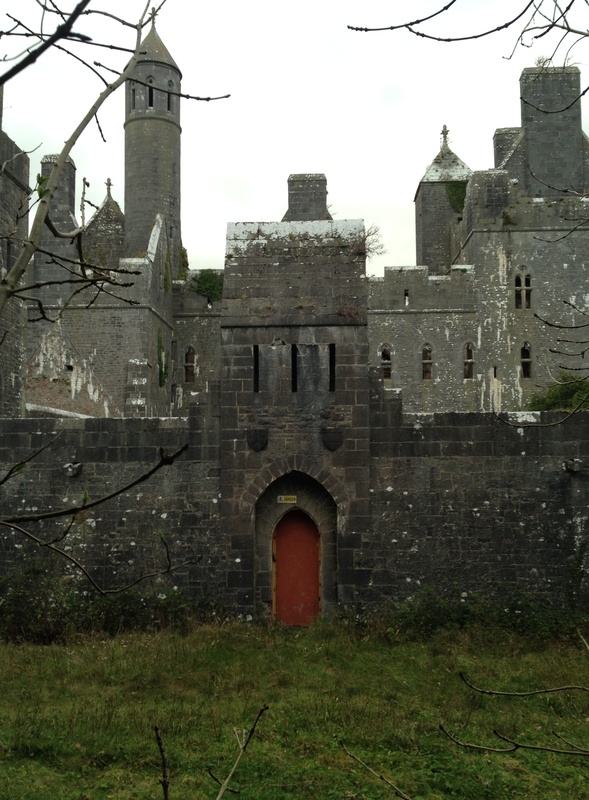 Since then the castle has stood empty, the dividing floors long gone so that now there is no difference between those areas once occupied by master and by servant: today all are equally open to sun and rain, and all share the same patina of neglect. Yet somehow enough of Godwin’s decorative scheme lingers on. It offers a tantalising sense of what Dromore must have looked like during its all too brief, but wondrous, heyday. 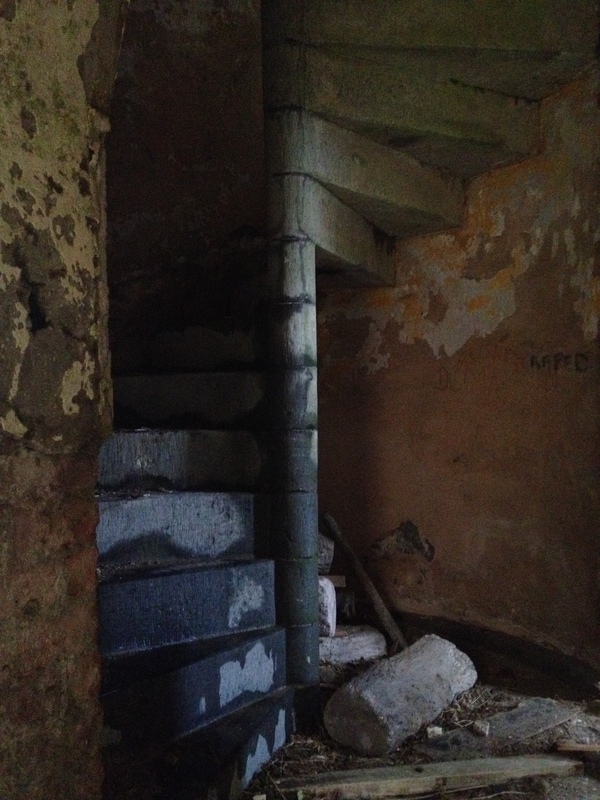 A stone spiral staircase leading from first-floor reception rooms to the bedchambers above in Dromore Castle, County Limerick. The exterior of this building, designed by Edward Godwin in the late 1860s, has featured here before (see Une Folie de Grandeur, 30th December 2013). 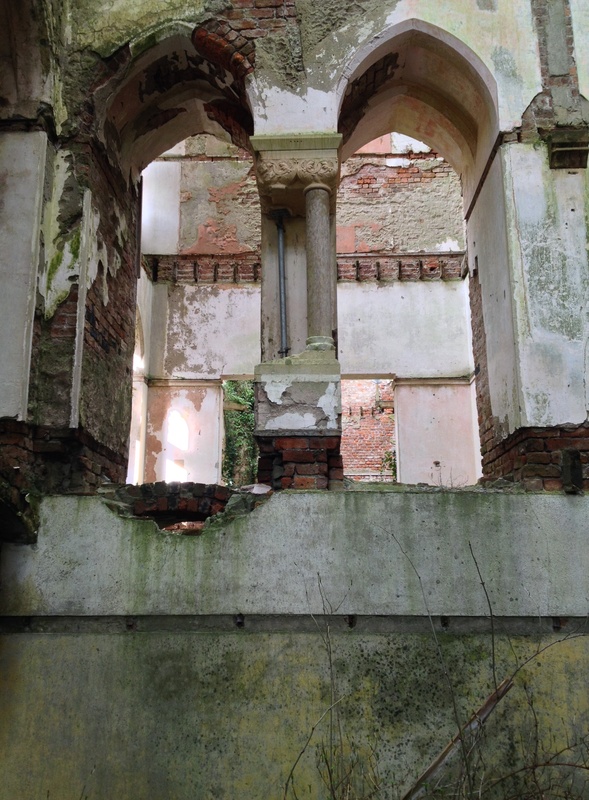 Next Monday’s page will be devoted to exploring what remains of Dromore’s quite extraordinary interiors. Driving west from Limerick city along the N69 after some ten miles one’s attention is caught by the spectacle of immense battlemented ruins to the right. 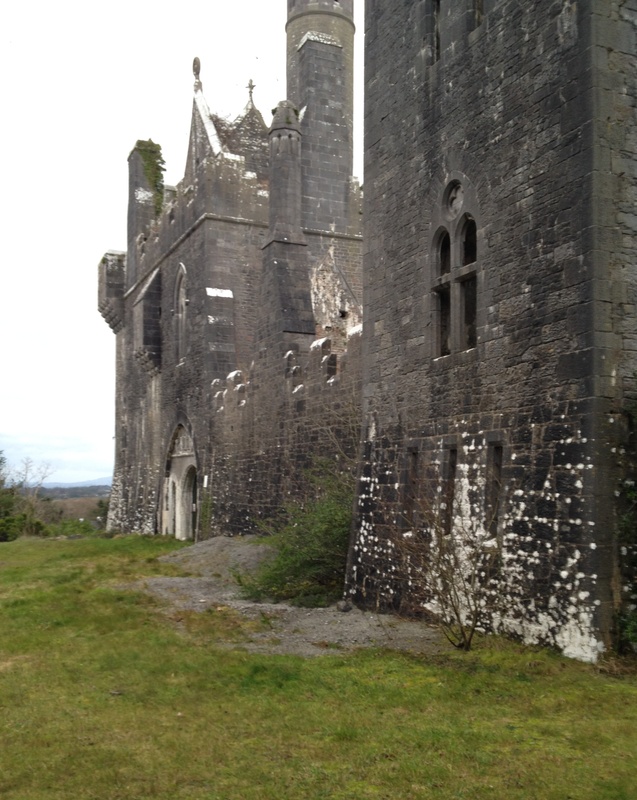 These are the remains of Dromore Castle, built almost 150 years ago, and unroofed for the past sixty. Situated on a promontory overlooking a lake and with sweeping views across the Shannon estuary Dromore’s dramatic silhouette, as has often been commented, would not look out of place above the Rhine. Yet one of the paradoxes of this extravagant building is that the architect responsible was anxious it be historically accurate to Ireland. Dromore was designed by Edward William Godwin whose influence on the late 19th century Aesthetic movement was considerable, not least because of his advocacy of Japanese taste: Whistler, for example, commissioned Godwin to build him a house in Tite Street (and later married Godwin’s widow) and another of his clients was Oscar Wilde. He also produced many designs for Liberty & Co where in 1884 he became director of the Regent Street store’s new costume department. 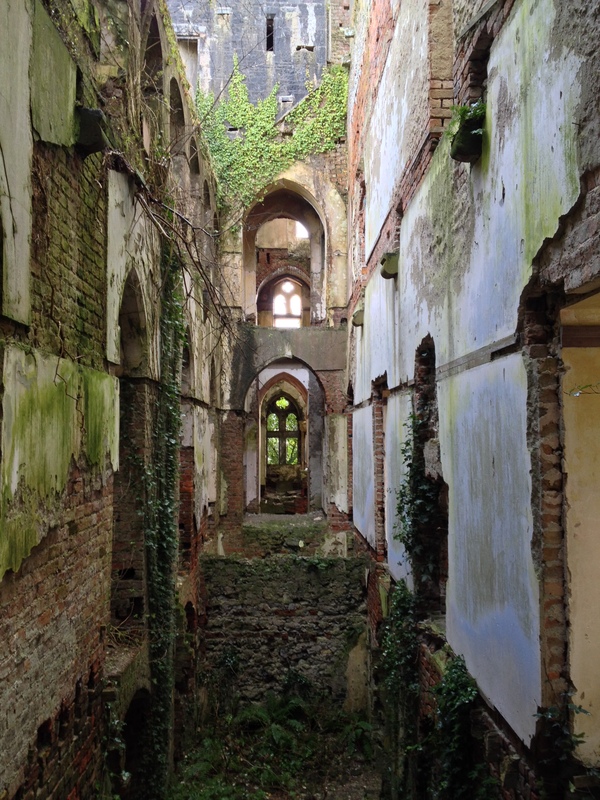 However earlier in his career Godwin had been a supporter of Ruskinian Gothic and one of the most fascinating aspects of Dromore is the way in which it reflects a transition in his interests and tastes. 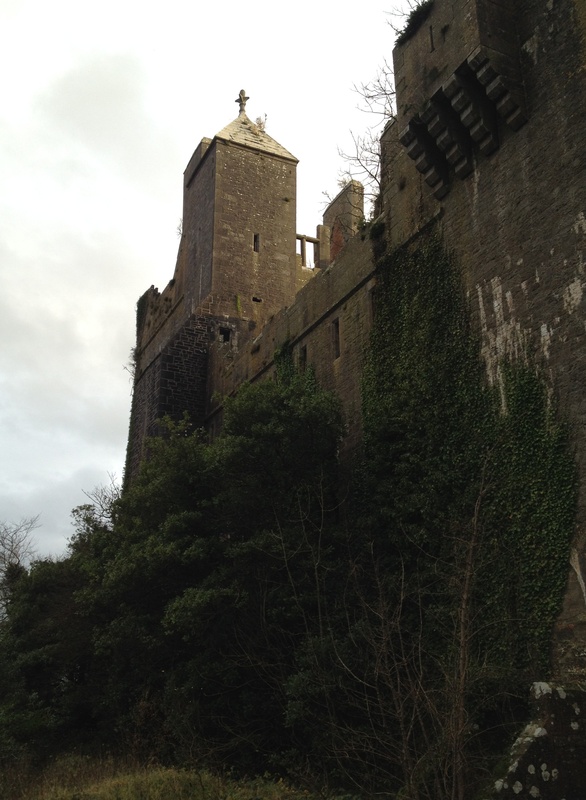 Dromore was commissioned by William Pery in 1866, the year in which he became third Earl of Limerick. 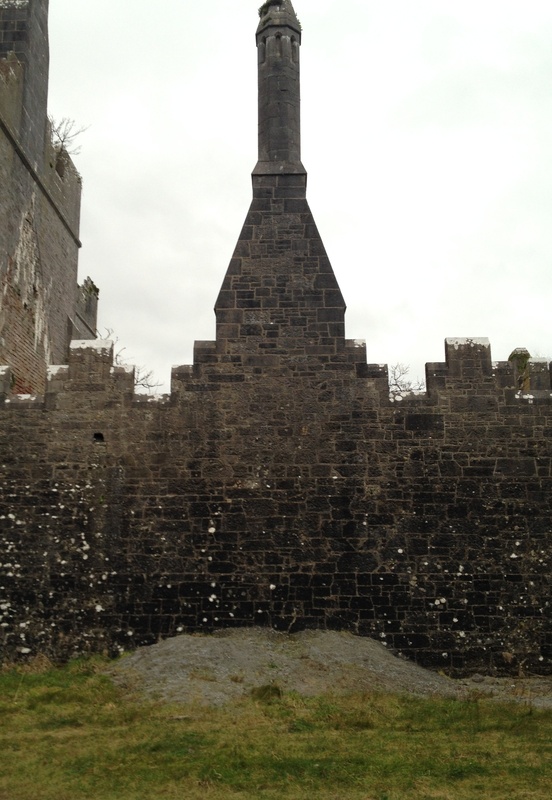 The Perys had been prominent in the region since the late 1600s, owning a large amount of land beside the mediaeval Limerick City; here in the second half of the 18th century the earl’s forebear Edmund Sexton Pery laid out what became known as Newtown Pery. Although the family had a large house in the city on Henry Street, it did not have a country residence in Ireland and for the first half of the 19th century the Perys spent the greater part of their time in England. Hence when William Pery chose to commission Dromore he was indicating a re-engagement with this country. It is open to question whether his decision was received with much favour here. February and March 1867 saw the failed Fenian Rising organised by the Irish Republican Brotherhood and at the end of the latter month the Building News, writing of Dromore, then under construction, noted ‘The corridors are kept on the outer side of the building and all the entrances are well guarded, so that in the event of the country being disturbed, the inmates of Dromore Castle might not only feel secure themselves but be able to give real shelter to others.’ The pictures above and below give an indication of just how difficult it remains to gain access to the building’s interior. 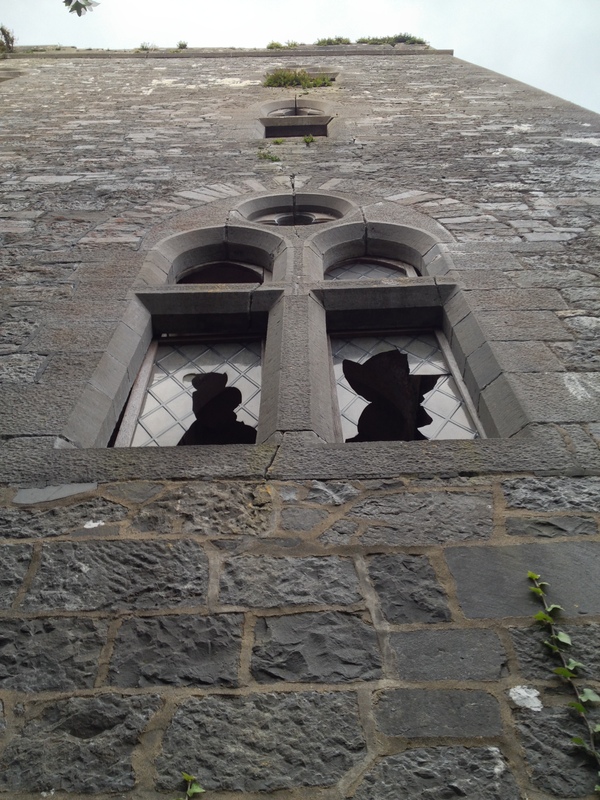 On receiving the commission from Lord Limerick, Godwin went to a great deal of trouble to make sure the building was authentically Irish in design. 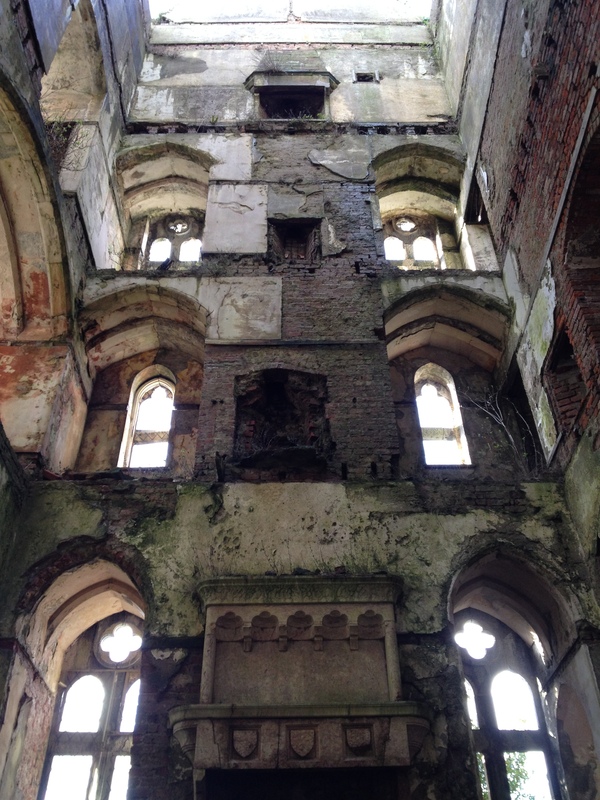 With his friend and fellow architect William Burges (then working on St Finbarr’s Cathedral in Cork) he travelled around the country drawing and measuring old castles and churches; what he saw during the journey influenced the eventual building which was finished by 1869. The initial impression created by Dromore, no doubt due to a lack of external windows on the lower levels of the roughly-dressed limestone structure and the loss of the original softening landscaping, is of sheer unadorned mass. With walls six feet thick, the entrance block to the south is of three storeys, the actual gateway being rather too squat (it immediately proved insufficiently tall to accommodate a coach and four). 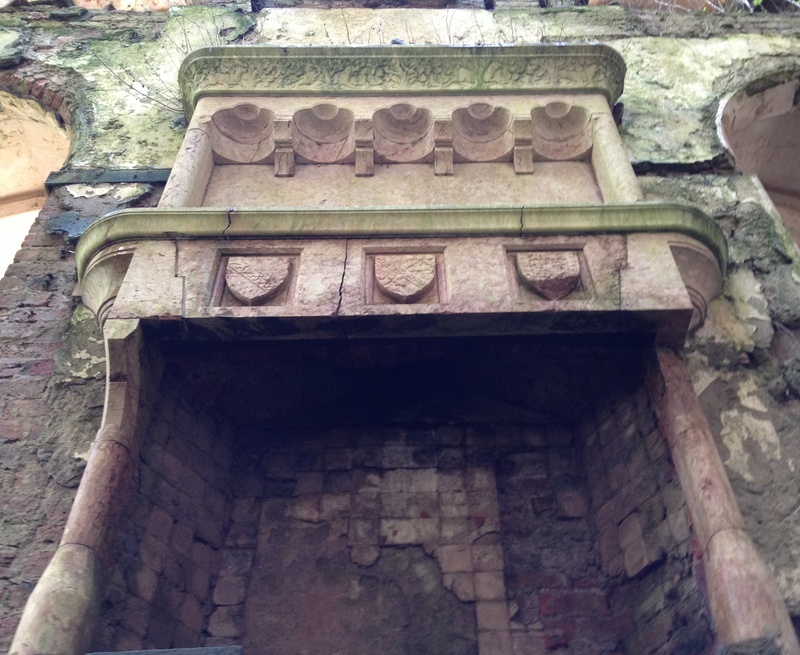 A tympanum above features carved lions flanking a sequence of heraldic motifs. Behind to the north is a larger five-storey main keep, this accommodated most but not all of the principal reception rooms. These two blocks overlook an internal courtyard on the opposite side of which are a range of service buildings that included both a chapel and a chaplain’s residence (presumably to increase the impression of mediaeval authenticity), as well as a banqueting hall. The last of these could only be reached by crossing over the entrance gateway, which must have been uncomfortable in bad weather. But again, perhaps this was to encourage the sense of re-enacting life in the Middle Ages. 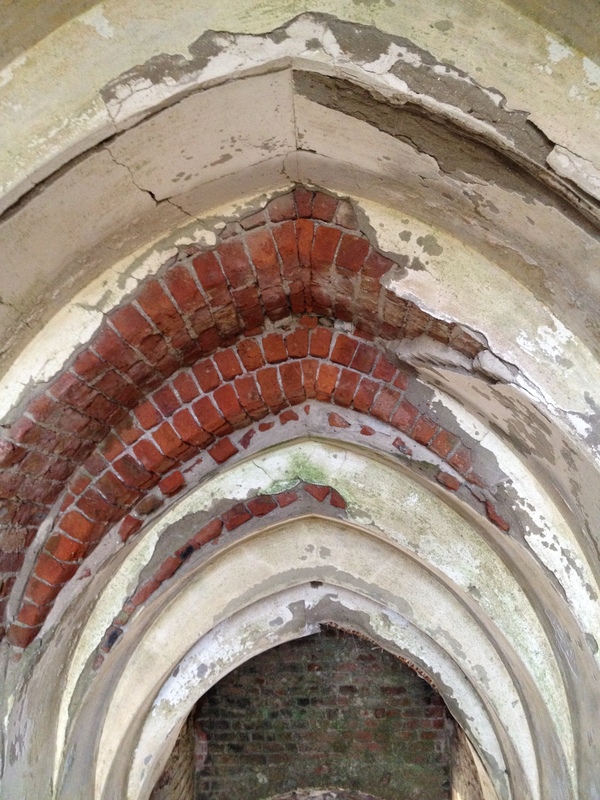 Most of the main windows take the form of paired lancets with quatrefoils above, although in the courtyard there are lines of single arched windows. Despite its relative austerity Godwin provided enough variation in the surface rhythm to hold interest; writing in Country Life in November 1964, Mark Bence-Jones noted how ‘There are Irish stepped crenellations, bold chimneys, bartisans and machicoulis on stout corbelling, trefoil windows and angle loops.’ As can be seen, the castle also incorporates a round tower, something not as a rule found in domestic residences, but Godwin appears to have included it on the grounds that such towers were found on Irish fortified sites like that at the Rock of Cashel. Godwin was responsible for not just the design of the castle but also much of its interior decoration including chimneypieces, wall paintings, sculpture, tiles, stained and painted glass, brass- and ironwork, and even the furniture, the manufacture of which was undertaken by William Watts of Grafton Street, Dublin. 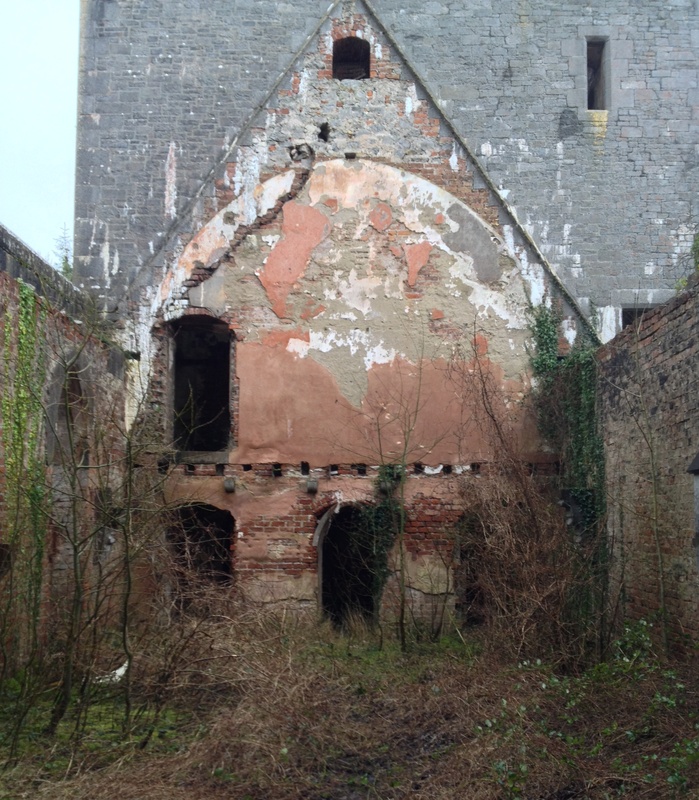 The subject of Dromore’s elaborate interiors will be discussed here at a later date. When the place was finished its owner professed himself ‘extremely delighted’ with the result. However, the family spent relatively little time at Dromore, and certainly not much after the third earl’s death in 1896. 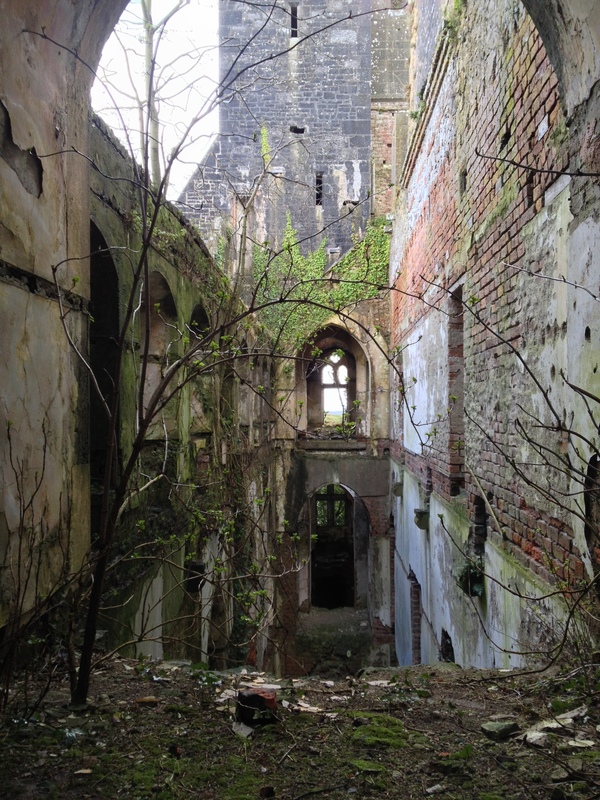 Valued at £75 and ten shillings in 1906, the castle appears to have been almost entirely unused in the aftermath of the First World War and towards the end of the 1930s the whole estate was sold to a local timber merchant called McMahon for a reputed £8,000. However, he did not live there for long and around 1954 Dromore was unroofed to avoid rates being paid on the building (a regrettably common fate for old houses at the time). And so it has remained ever since, indomitable as Godwin intended and proving able to withstand the assault of time and an inclement climate without demonstrating evidence of dilapidation. 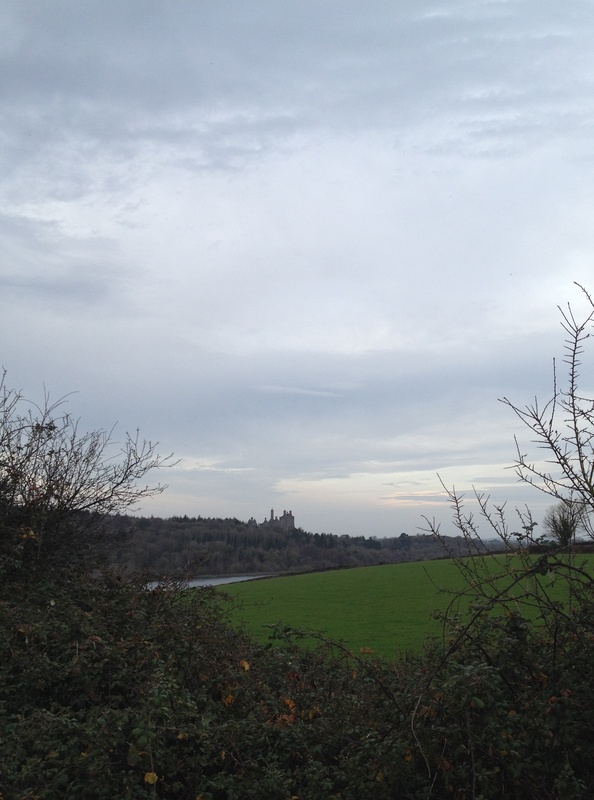 Rising above the surrounding woodland Dromore’s silhouette continues to dominate the skyline for many miles around and continues to give the impression of a Rhineland castle transported to west Limerick.